When I was first diagnosed with celiac, back in late April of 2005, I was exhilarated to have an answer to the question plaguing me for years: why do I feel so awful? But I was also overwhelmed, especially the first time I went grocery shopping. That first trip took me 3 hours. I spent 3 hours in a small grocery store, picking up every single food item and examining the labels, wondering if I could eat it. Would there be cross-contamination? Did it have hidden gluten? Was mayonnaise safe? How about that yogurt? I persisted, and I figured it out, but those first six months or so of being gluten-free meant living in a constant state of unrest and doubt. What I would have given to own a copy of Cecelia’s Marketplace Gluten-Free Grocery Shopping Guide. This handy guide contains exhaustively researched lists of food items, currently on the market, that are gluten-free. It’s an excellent resource for anyone who is gluten-free but especially for those of you who are new to living gluten-free. This is why Cecelia’s Marketplace Gluten-Free Grocery Shopping Guide and their accompanying smartphone apps (download them today!) are our newest sponsor. We’re proud to bring them to your attention. You need this resource. We asked Dr. Mara Matison to tell us about her company and their story. What made you begin writing the Gluten-Free Grocery Shopping Guide? After years of mystery symptoms that my doctors could not find an answer for (heart palpitations, tingling lips, itchy bumps on my skin, sudden urgencies to run to the bathroom), I am forever grateful for the gastroenterologist that finally diagnosed me with celiac disease in 2006. But going gluten-free was not always an easy road. I initially had a very difficult time finding gluten-free products. Not knowing a thing about “gluten-free” at the time, except for the information I researched online, the whole process was an overwhelming experience. Every day I had to question what I put in my mouth, in fear of gluten ingestion and a relapse of symptoms. It was this drastic lifestyle change, that involved a lot of reading labels, calling food manufacturers and worrying about cross-contamination, that drove me to publish our gluten-free guide. There was no “easy reference book” available and my frustration grew rapidly. So, as my husband and I gathered all this ‘golden’ information we decided to compile it into a small guidebook. We figured other people being diagnosed must be feeling the same way as me? Lost, confused and looking for answers. Well now, 8 years later and 6 new updated editions, Cecelia’s Marketplace Gluten-Free Grocery Shopping Guide is the nationwide best selling guide on the market, won numerous awards, has received rave reviews and has helped thousands of people safely follow a gluten-free diet! In addition, for those people that have multiple intolerances, we expanded our guide selection to include a Gluten/Casein Free and Gluten/Casein/Soy Free Grocery Shopping Guide. I hope and truly believe that we have already helped thousands of people ease into a gluten-free diet. I remember that there were days that I had tears in my eyes that I was so frustrated and felt so isolated thinking “what can I eat”? My hope is that I have helped to eliminate that doubt and frustration from anyone looking or needing to start a gluten-free diet. For some people, including myself, this can be a life-changing experience. Going from feeling horrible with no energy, to feeling a thousand times better, energized, and able to live again! Can you tell us about your smartphone apps? How do they meet a different need than the guidebook? Ahhh…the new smartphone apps. Yes, they are wonderful! These are for all you “techies” out the there that don’t like reading books anymore. We released our updated iPhone app earlier this year and for those of you writing us and patiently waiting….you’ll be happy to know that your prayers have been answered. Our ANDROID app was just released last week! But in support of our guidebook, I feel it’s always nice to have both on hand, the book and the app that is. I know there have been times that my iPhone battery was dead and I luckily had a copy of our guidebook in my purse to quickly double check the gluten-free status of a product. Some people also are just more “book people”, they need to see it written out, like me. While others love all the new technology and would rather opt for the app. It’s just a personal preference. Wow…this is a toughie. Seems like there have been hundreds of tear jerkers that we’ve either experienced personally or received via email. I will name a few. My sister…2 years of severe panic attacks (to the point where her social life was getting so compromised by these heart pounding, sweating, uncomfortable, “get me out of here” situations, that I suggested maybe she should try a gluten-free diet.) I gave her our GF guide and within 1 month, all her symptoms were gone! Totally gone! Kind of crazy if you think about it…those nasty little proteins…what they are doing to our bodies. Another story. My girlfriend, diagnosed with Langherhans cell disease. Basically started out with small ulcerations in her skin that kept expanding and eating away at her skin. What a devastating very cruel disease. Multiple doctors ran tests, and by accident she found out she also had a high sensitivity to gluten. She went gluten-free and used our GF guide religiously and the ulcerations completely disappeared. This was such a miraculous recovery that one of her doctors proceeded to investigate the possible link. I’m not saying this is a cure for the disease, but a lot can change in your body when your immune system is no longer compromised. Okay…one more story that sticks in my mind. A young girl came up to our booth at a book signing event we were hosting. She said, “I’d like to thank you for all the work you have done. Your book saved my life.” She proceeded to tell me that she had been misdiagnosed with MS (Multiple Sclerosis). Parts of her body were shutting down. She was no longer able to move her left arm and her speech was getting slurred. Someone, somehow… recommended a gluten-free diet. She used our GF guide book, followed a strict gluten-free diet and started regaining all feeling in her body. When I met her she was a happy healthy college student, and you would have never known what she had been through. What do you see as the future of gluten-free? Where is your place in it? The gluten-free market is growing at such a rapid pace, I know that some skeptics think it may crash and burn, along with other diet fads. But, I think completely the opposite. First of all, it’s not a fad. For most of us, like me, with celiac disease….it is a permanent lifestyle change. There are so many people yet to be diagnosed with celiac disease and so many others with gluten-intolerance that I only see great things for the gluten-free market in the future. Tastier breads, beer with great flavor, crispy pizza crusts, lower affordable prices, and more restaurants offering gluten-free menus. What I feel will further this upward trend is the fantastic feeling people get from following a gluten-free diet. For instance, my husband chose to go gluten-free with me a year after I was diagnosed. His psoriasis completely cleared up, his post nasal drip cough disappeared and he’s had better nights’ sleep. He won’t even touch a piece of regular bread now. So if eliminating gluten from one’s diet helps them get rid of unwanted symptoms, I believe gluten-free is here to stay. As long as customers are continuously looking for the most ‘up-to-date’, most reliable gluten-free product information, Cecelia’s Marketplace Gluten-Free Grocery Shopping Guide will be here for them. The 2014/2015 edition is now available. We have re-verified all of our product information, including the new labeling laws, the latest product ingredient changes, new GF dedicated facilities, new certified gluten-free products, and added new gluten-free products. With our Gluten-Free Guide, as well as our Gluten/Casein Free and Gluten/Casein/Soy Free Guides, we have helped thousands of GF dieters nationwide find the most accurate gluten-free information possible. For more information on all of our helpful gluten-free resources, please visit www.CeceliasMarketplace.com. The Matisons would like to give away a copy of the Cecelia’s Marketplace Gluten-Free Grocery Shopping Guide to three lucky winners here. Simply leave a comment explaining why this would be of use to you! We’ll choose three winners at random on Friday, November 7th and inform the winners by email. My daughter is extremely overweight and I’ve suggested many times that she try being gluten-free – if I’m a luck winner, the book will be hers. You never know, it just might make a difference. Thanks. Our three year old son was diagnosed with Celiac in June- this would be helpful to us as our entire household is now gluten free. Hi, my name is Valerie and I have been suffering from skin problems for over a year. I did do an elimination diet of which disclosed a gluten and dairy allergy. I have found if very difficult to find gluten free items that don’t cost a fortune. Infact, if I wasn’t on food assistance, I would only be buying a limited food source. I have found some items that are labeled gluten free are still causing a reaction in itchy, bumpy skin rash from head to feet. Right now, I am dealing with scabies even though we have treated with 2 episodes of the lotion and 1 treatment of ivermectin. Weird thing is no friends or family members have contracted this highly contagious skin irritant. Right now, I am miserable. I do not have insurance so I am dealing with limited resources. Also, I have atopic eczema. The eczema makes it difficult to determine what allergy symptoms are really occuring. I have spent countless time in the grocery store reading labels, too. In particular, I have aspartame and lanolin allergies along with nitrates/nitrite allergies. I am getting to the point I do not want to be in public, because of how my skin looks and the fatigue I feel on a daily basis. It would be greatly helpful to have a guide to cut some of hassle of deciphering the “ingredients code” that most people do not understand. Food names and product ingredients come under misleading names. Years ago, I had to look at every cream, lotion, salve, and soap to make sure lanolin isn’t included in the product. There are over 200 names for lanolin! In addition, I find it very hard to eat in restaurants. Some do have allergy guides, but they have very limited food items to eat or they an overwhelming list that leads me confused. There is something attacking my system. It would be helpful to weed out items that I might be missing. Plus, identify those things that I may have problems to because of other food allergies. 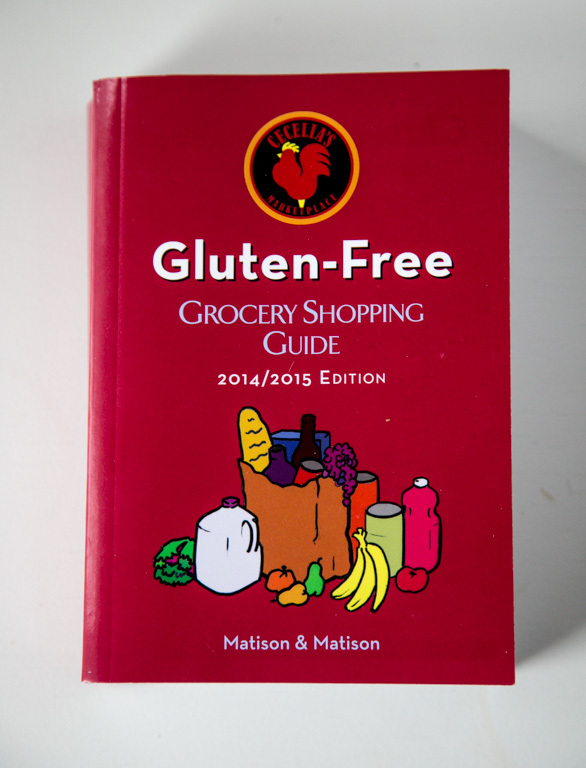 Thank you for putting together the gluten free guide. It will be very helpful to people like me who are still new to the gluten free industry. I learned I needed to go GF almost 2 years ago. I still find myself at times standing in the grocery store at a loss when I want to try something new. Your website has surely been a life changing experience for me. This book would be a wonderful addition. This would be so helpful, I spend so much time checking labels. It would be nice to have this for reference! My husband has had dermatitits herpetiformis for 12 years, and has been managing it mostly well – but has had unexplained outbreaks this fall. Maybe this book can help us figure out where the hidden gluten is. I have found your books to very helpful and know this guide would add to them. My plan (if I win this) is to gift this guide to my grand-childrens kitchen as they also eat gluten-free. Sometimes I just want to curl up in a ball and cry! Food allergies and bad intolerances that make you sick are discouraging. Whole foods have been the only safe foods and reading labels and trying to figure out the ingredients you cannot pronounce on other foods, is very time consuming, difficult, confusing and often misleading. I would love to have a copy of your book to recommend to be added to the collection of the library where I work. I discovered I was gluten intolerant two years ago after having a bowel blockage with diverticulitis. A holistic Chiropractor discovered my sensitivity to gluten. One week off gluten and I no longer had the problem with diverticulitis. An added unexpected bonus was no more neck pain. I’d had about 20 years of chronic neck pain from an old auto accident which also stopped hurting. I’m having our library’s first Gluten- Free Expo this Sat. You’d book would be a fine addition to our collection. I would love to have a copy of your book to recommend to be added to the collection of the library where I work. I discovered I was gluten intolerant two years ago after having a bowel blockage from diverticulitis. A holistic Chiropractor discovered my sensitivity to gluten. One week off gluten and I no longer had the painful diverticulitis. An added unexpected bonus was no more neck pain. I’d had about 20 years of chronic neck pain from an old auto accident which also stopped hurting. I’m having our library’s first Gluten- Free Expo this Sat. Your book would be a fine addition to our collection. I am 53 but feel like I am 90. I have no insurance, so I am left to my own to find the solutions to my IBS and health problems. I have tried to go gluten free, and it has helped, but I still think I have a lot to learn before I finally feel better. I know this book would help! Thanks! I am so excited to see this great reference! I become especially frustrated when I need to take a medication and have to call the manufacturers as to whether their products are gluten free. Many times I have gotten the run around and told they can only speak with my doctor. Sheesh! This would also be a wonderful guide for me to carry at the store. I cannot do gluten or casein and it is difficult to find products that do not have dairy in them when they are gluten free. I have a four year old that is also restricted to a gluten free diet, so to be able to find what we need at the store quickly would be awesome! Thanks for the great work. Keep it up! I would love to send it to my neice who is a freshman at Barnard. She has serious gulten issues and needs to be so careful with the way she eats. Thank you!! I am so thankful that more people are aware of gluten issues. I had to relearn how to eat and read label after label. Thank you for writing this guide! It would make shopping less of a chore. I have just started to bake gluten free goods and have enjoyed shopping for gluten free products. It has been an amazing education and I think this new guide would make it so much easier for me. We had an outdated copy of this book. We loved it! Such a great resource. Our six year old has Celiac Disease and shopping is such a chore sometimes. Having this little book helped shopping go so much quicker. Our family would love a copy. We have three family members who have Celiacs disease and other multiple allergies including casein and soy and we are always on the search for things that are safe to eat. I’ve been so appreciative of all the recipes and helpful comments. This book would help me figure more things out, as we wait on doctors. I would love to use this book as a reference for the myriads of people who ask me how I have been so successful in managing my Celiac disease! I, too, spent hours upon hours in stores reading labels and have so often written lists out for people first diagnosed. so thankful for the hundreds of resources on the web and bloggers like you that make it so much easier! Sometimes the grocery store is overwhelming when trying to find things other than meat/veggies. This would be so helpful! Your book looks interesting and helpful. I am following gluten free after being diagnosed with celiac disease. It is definitely a challenge to eat things that are gluten free, great tasting and healthy. I have Hashimotos, as well as Fibromyalgia . This book would be very helpful, because even though I had been diagnosed with Hashi’s over 20 years ago I only just discovered the benefits of going gluten free for it. I’ve been gluten free since July 2014 but I continue to ingest accidental gluten from time to time and it sets me back considerably. I’d love a comprehensive guide to follow. Thanks! I shop at a co-op which is fair about identifying GF products. Need help in identifying more of them. I’d look for products in other stores, also. This book sounds wonderful to use when planning my grocery list! I went GF almost 2 years ago & now the doctor thinks my husband has a gluten problem and he is being tested. I appreciate all the work that went into creating the book. Thank you! I think shopping gluten free is overwhelming, so I just stick to whole foods.But… I have a hard time packing lunches or travelling through a grocery store. I would simply like to know of more options and this book sounds like a great way to get more information. How awesome would this be? The grocery store can be so confusing! This would be so helpful and I would LOVE to have it! After suffering from multiple symptoms for the better part of 20 years (40 according to my mom!) I finally got my diagnosis last week! Having never felt truly healthy as an adult, I’ve spent thousands upon thousands of dollars in a quest to uncover the insanity of the origins of my constant plague of symptoms. It’s profoundly sad that so many doctors never think to look for something as simple as a gluten issue. I’ve been told I have, or may have Chronic Fatigue Syndrome, MS, Fibromyalgia, Sjogren’s, IBS, IBD, Crohn’s, ulcerative colitis, and worst of all, that nothing was wrong! My thyroid quit about four years ago and the doctor (or me for that matter) never thought to question why this would happen. I dutifully resigned myself to synthetic hormone medication for the rest of my life. Fast forward three years, I began experiencing severe gastrointestinal distress on an almost daily basis. Earlier this year, it was discovered that I had iron deficiency anemia so the doc put me on iron pills and told me I was fine. After six months of taking iron supplements, I was still presenting with iron deficiency anemia and at this point my hair was falling out at a terrifying rate, along with a long list of other symptoms characteristic of anemia (and Celiac). By some stroke of fate, the doctor could not see me that day so I was scheduled with the APN. I was reluctant to trust her but didn’t want to cancel the appt. When she saw the anemia she told me this was a red flag and that I needed to be checked for colon cancer and to figure out why my body wasn’t absorbing iron (even she did not mention gluten). At my first GI appt. he literally sat across from me in the examining room and told me “you look fine. I’m sure nothing is wrong with you and I don’t think you need a colonoscopy.” This was his “opinion” after just talking to me in his exam room for about five minutes! I told him that I wanted to be tested for gluten intolerance. I brought this up, not him. He said he would go ahead and order the tests, but once again told me, “I’m sure these will all come back negative.” As he got up to leave, he told me that he would call me if any of the tests came back abnormal. Two weeks later, I’d almost forgotten about the lab work, except that the lab had sent me copies of the results. I figured that since I hadn’t heard from the GI doctor, his “instincts” must have been right and that everything came back normal. Those results sat unopened on my kitchen counter for another three days. Finally, I opened the results and discovered that my ttga results were seriously high, absolutely nothing NORMAL about them! I called the doctor immediately to inquire as to why he had not called me. Of course I had to speak to a nurse and she said he had not gotten the results yet (we were going on three weeks now). Later that afternoon the doctor finally called me back to tell me that it did indeed appear that I have Celiac Disease. He told me I would need an endoscopy to support the lab results. I insisted on a colonoscopy as well since I wanted to make absolutely sure that I had not damaged myself to the point of cancer (after all, I am raising three young children). I had the endoscopy and colonoscopy last week and it was confirmed that I do have Celiac Disease. Thank God there are no signs of cancer in my colon. I am seriously relieved that I finally have confirmation that I am not crazy, that I have not been imagining all of these symptoms for most of my life, and most importantly, that I can do something about it. I can’t stress enough to others out there to not give up, keep searching for answers, and be your own doctor. If I had listened to the GI doc, I would still be taking my iron pills, still be anemic (and probably almost bald by Christmas! ), still be undiagnosed with a serious, and possibly life-threatening illness if left untreated, and still be paying off those medical bills for nothing! I noticed an immediate improvement as soon as I went off gluten and am now navigating the gluten-free world, albeit with a “nervous fork!” I haven’t been brave enough to eat out yet but we are taking a trip to Disneyland in December that was planned months ago. I am already worried about how I’m going to trust others to prepare my food while away from home for an extended time. I’m sure there is some trial and error involved but I’m finding comfort in the many resources and support for Celiacs. Thanks for reading my really long post! I am a celiac and also was extremely nervous about eating outside of my home and risking cross-contamination. You will be very relieved to know that disneyland goes above and beyond in providing allergy friendly delicious meals. I was able to safely enjoy a delicious hamburger (with a bun! ), among other great meals. They have a dedicated area where they prepare gluten free meals…. Oh and by the way, you are not alone in your story. Took me around 15 years of weird symptoms before I was diagnosed! Acid reflux, numb lips, sleep apnea, heart flutters, restless legs, and on and off anemia….and this is to name just a few symptoms. Everything now is gone after I went gluten free! I use this grocery guide religiously to make sure I am eating safely. Thank you Shauna for highlighting it for all of us to see. I buy every edition they come out with. I absolutely love it! Oh grocery shopping…a simple task and yet it still takes hours. My husband doesn’t even go with me anymore because it takes forever. I would love to have this book at hand – especially when trying a new recipe. That’s when it takes the most time because I have to research all the ingredients ahead of time and pray the store carries that brand. It sure would be great to take just the recipe, find the ingredients at the store, and cross reference them with the book. A gluten free cook’s dream come true! Honestly, I’d trade it all for the pharmacy section of the book. PLEASE consider an app for this. I’ve struggled with gastro symptoms and anxiety since I was in the third grade. I’ve been tested for celiac at least 3 times in the last few years since I had basically every symptom imaginable and all came out negative. It wasn’t until this past February (at age 33) that I spoke with my dr about making some drastic diet changes. I’ve been gluten free for 9 months (yesterday) and so many things have improved it’s remarkable. I might have been negative for celiac but I know I can’t tolerate gluten. I’ve done a lot of work to get to where I am but that book sounds so wonderful in expanding my knowledge of products/places I can eat safely without having to worry. We are a gluten-free household since January of this year (mostly, with a few inadvertent slip-ups). This will be an extremely useful reference! Sure, why not. Pick me. I have rheumatiod arthritis and even though I am on drugs for it, I still have lots of pain. I have other things happening that I didn’t realize it until I read this post that might be related, tingling lips and rashes. I have been looking at my diet and I’m doing Whole30. I could really use some help for when I’m done. As the years have gone by, I have noticed more and more food sensitivities. This book looks like something that would be very useful for me in shopping and knowing what I can eat. I have a 10 year old with Celiac, and this would be such a valuable tool for my husband. Since my celiac diagnosis 15 months ago, I have been focused on getting healthy again with a very minimalist strategy: I only eat whole foods which are naturally gluten free. As in, lots of eggs, roasted meat with herbs, and sauteed vegetables. Now that I’m feeling better than ever, I’m more eager to see what is out there that I can eat safely! I want to vary my diet with snacks, gluten-free bread and pasta products, more sophisticated entrees… Basically, I’m ready for my meals to look like typical American fare again, if that’s at all possible. This book would be a great resource! I was sick for so many years. I was cast under the “IBS” umbrella. I knew better . My mother has been sick since her teens and has also had her gall bladder out. She is on pain meds, anti-depressants, she has a thyroid problem and heart problems, not to mention depression & her hair is falling out. I chose to figure out what was wrong with me. Going gluten free was wonderful! However, I wish I had known: 1.) Cook all fruits/veggies & peel skin! Your digestive tract is weak and needs some help while healing!!! Also, stay away from “substitutes” just eat clean. Meaning no crap! Your body will thank you very much! I have been trying to follow a gluten free diet for about 5 weeks. My weekly migraines are gone and the pain in my gut is history. Yet I keep getting “setbacks” from the hidden forms of gluten in foods I eat. I spent 2 hours last night at the grocery store reading every label. I was unable to find many things on my list. I am tickled pick to find this guidebook! We have been living GF for 6 years now and I would love to be able to quickly know if some of the processed foods we buy are truely “safe” and if there are some that are indeed safe, that I haven’t risked yet, just because I don’t know and don’t have the energy to investigate! We have three kids now, our budget is stretched thin, so this resource would be great for helping diversify our diet! This would be great to have as I travel all over the country, so often I am not as familiar with brands in different parts of the country. I have enjoyed your blog for years. My niece, Su, enjoyed being part of your event in Italy a couple of years ago! I have a gluten allergy, but my daughter has terrible reactions and is uber cautious about what she eats. I’d love to win this for her to make her life and food choices simpler and more accurate. I would love to win this. Thanks for the giveaway!! PS. I won a book a while ago from a giveaway you had and I never received it. It was a Paleo diet book. It was a few months back before the little one arrived. Thank you thank you for this! I keep accidentally getting gluten despite my best efforts. I live on an overseas military base with a limited selection of grocery items. This will be such a help to me! I wish I had known about this book when my daughter was diagnosed. It would have been fantastic! I am certain it will come in very handy. Wow. So glad I found this site. I’m a type 1 diabetic and I’ve been eating low carb for the last 5 years or so but once research started coming out tying Celiac or gluten sensitivity to type 1, I decided to get tested. I only tested for gluten sensitivity since they want me back on gluten for the celiac test. I tested positive with elevated sensitivities to gluten (as well as dairy, soy and egg). I also have the gene for celiac and it could be affecting both of my children. My daughter is overweight – really for no fault of her own, all to the middle, has ADD or brain fog. So hard. And she’s in college. My son has had health issues for the last 2 years. He’s 15, and wouldn’t want to hear he has celiac or gluten sensitivities but I want them both happy and healthy. The easier I can make it for them — and for me, the better. I’m new at this! My daughter has had celiac for over ten years, at that time it was very hard because there were not many people or restaurants that were really aware of celiac. My daughter is highly sensitive sometimes putting her to bed for several day, About a year ago she was diagnosed with diabetes so now she have to also watch this, this book I think would be very helpful for her.